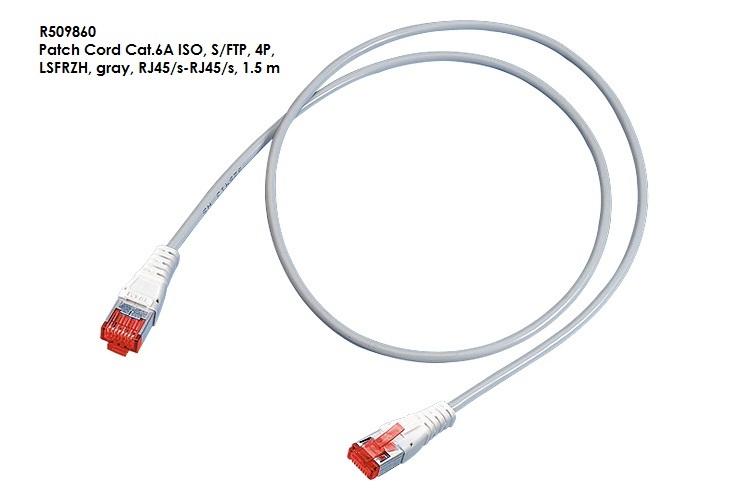 Flexible cable, S/FTP, 4 x 2 x 0.14 (AWG 26/7), color gray, mounted on both sides with RJ45 connectors compliant with Cat.6A ISO component standard: IEC 60603-7-51 RJ45 category 6A ISO (500MHz), shielded. For the setting up of transmission channels of Class EA with up to 4 plugged connections acc. to ISO/IEC 11801 ed. 2.2, June 2011, EN 50173-1, May 2011 (DIN EN 50173-1). Complies with Category 6A ISO requirements of the standards ISO/IEC 11801 ed. 2.2, June 2011, EN 50173-1 May 2011, as well as TIA 568-C.2, interoperable and backwards compatible with Category 6 and Category 5e. Suitable for 10GBASE-T applications in acc. with IEEE 802.3™ Section Four up to 500 MHz. Low-smoke in acc. with IEC 61034, flame-retardant in acc. with IEC 60332-3C and halogen-free in acc. with IEC 60754-1. Halogen-free and heavy-metal free in acc. with EU directives RoHS 2. Standardisation : Compliant with Cat.6A ISO, Class EA (500 MHz) requirements: ISO/IEC 11801 ed. 2.2. Complies with Category 6A ISO requirements of the standards ISO/IEC 11801 ed. 2.2: June 2011, EN 50173-1: May 2011, as well as TIA 568-C.2. Compliant with Cat.6A ISO component standards IEC 60603-7-51. Fulfilled the standard IEC 61935-2:2010.